Born Julius Caesar Russo, Saint Lawrence entered the Venetian province of the Capuchin Friars in 1575. Ordained in 1582, having completed his ecclesiastical studies as well as becoming most proficient at Hebrew, Greek, German, Bohemian, Spanish and French. Lawrence began to preach throughout Northern Italy and beyond. His success at preaching is attributed to his extensive use of Sacred Scripture. Between 1599 and 1613 Lawrence established the Order in Bohemia, Austria and Germany, thereby reclaiming many souls from Protestantism. He also displayed his skill as a diplomat when in 1614 he was able to restore peace between France and Spain. In fact, it was in true Franciscan fashion, as a missionary of peace, that he finally died at Lisbon while on a mission to Spain on behalf of the oppressed people of Naples. Lawrence was for the majority of his Capuchin life a major superior in which office he continually strove to stabilize the Order, balancing the rigor of primitive Capuchin life with the needs of the time. He is likewise remembered for his great theological work "Opera Omnia" of fifteen tomes in size and characterized yet again by the prolific use of Scripture. In the life of St. Lawrence of Brindisi, we see a man full of the courage and daring of Christ whose spirit carried him throughout the long and arduous years that he was engaged in a most trying apostolate. Of him, it can be truly said that he possessed the special gifts that adorned the Churches' first Apostles and men were moved to the practice of virtue more by his example than by his words. Especially noticeable in Laurence's approach to life was his spirit of fortitude which enabled him to announce the Good News fearlessly and constantly, even among the very Jews of Rome. Lawrence's power and effectiveness as a preacher which was witnessed to the Christian life derived from the intense interior life he managed to observe during the course of his busy life. The two great loves of his life were the Mass and the Blessed Virgin. The Eucharistic Sacrifice was the centre of his existence; he had on rare occasions been known to spend up to four hours saying Mass and in 1610 in Genoa on Christmas Day, he took a staggering 16 hours celebrating in Ecstacy, weeping with love and adoration. Also extraordinary was Lawrence's love for Mary, from whom he attributed receiving his vocation, his success in the apostolate and especially his knowledge of Hebrew. He regarded Mary as the font of Mercy and the kindest of Mothers. It belonged to Pope John XXIII in our own day and age to further honor this amazing son of St. Francis by proclaiming him Doctor of the Universal Church. Our Lord chooses the humble of the earth to confound the proud. 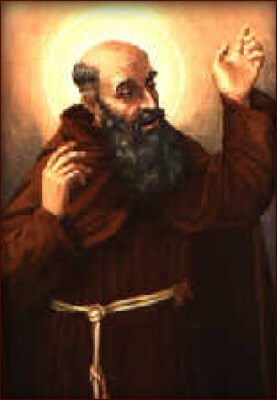 In St. Lawrence of Brindisi, he called a humble son of St Francis to further increase the light of Christ in the world by his powerful preaching and prolific writings. His feast is celebrated on 21st of July.